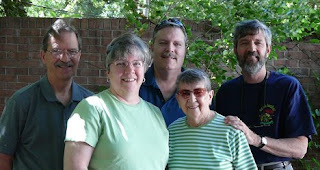 Here we are, my three brothers, my mother (soon-to-be 89 years old), and myself during our extended weekend in Salt Lake City. It was a rare and delightful treat to be together again. The temperatures were incredibly hot — 103 degrees on Friday! — it was desert “dry heat,” which is much more tolerable than humid heat, but hot as the dickens nonetheless! We stayed indoors during the worst of the heat and talked non-stop, pulling out memories from long ago and working collectively to put all the details together again. This is a family of storytellers, so there were many details to remember and numerous versions of the shared experiences of growing up. No reading done, but what a happy weekend! This entry was posted in Life, Memories on August 5, 2008 by Robin. I hope someone does indeed write down the stories. So very many are lost. What a nice weekend! I can sympathize with the heat. We have been baking here in Texas. Lovely, lovely family photo. Thank you for sharing it with us. You're right, Nan! That "aural kind" of reading is wonderful. Actually, my Dad wrote down many of these stories in his extensive "family history" scrapbooks. It was his hobby as an historian and a librarian, so many of our family's stories and pictures are saved for the generations. That's why I have access to such great old family photos! What a gift! Thanks, Gentle Reader. It was a wonderful visit. Thanks, Kay. I'm not one that loves the heat of summer. I prefer the milder temperatures, but it was worth spending the weekend in the heat for this visit!